Since 1992, Jason Dean and Matthew Nash have been collaborating on creative projects under the name Harvey Loves Harvey. They were a punk band before maturing into visual artists. Their work takes many forms, including video and photography, performance art, interactive media, installation and sound. Their work is often humorous, driven by a compulsion to understand the complexities of human interaction, especially when things fail to work. The two artists have rarely lived in the same city over their 20-year collaboration, and much of their work deals with what happens when technology inserts itself into the problem of communication. 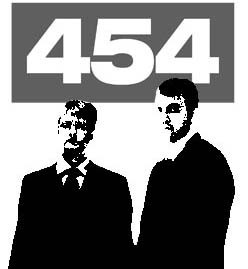 454 Productions began as a way to capitalize on their collaboration and focus their energies on film projects. Dean works in production for the film and television industry, and Nash has the resources and creative support of a university, as well as a drive to tell stories, so the process was a natural progression of Harvey Loves Harvey's work. The first project of 454 Productions was a failed attempt to make a mock-documentary in the style of Ross McElwee's 1986 classic Sherman's March titled After Sherman's March. While the resulting film is not satisfactory, it allowed Nash to explore a form of personal narrative storytelling that would lead to 16 Photographs At Ohrdruf. The second 454 Productions project was What Are We Saying? This piece is a 14-minute short that returns to the theme of communication failures. It challenges the idea of Performance Art with a cinematic and narrative style. 16 Photographs At Ohrdruf is the first full-length feature from 454 Productions.